Sathya Sai Baba would not have lasted one minute as a stand-up comic because the supposed jokes he made were very few and far between and then not really all that funny. He made fun of people in interviews, invariably to show how silly, weak or confused they were and to enhance his supposed know-all image and to raise a laugh at their expense (always guaranteed as too many devotees were very competitive and often back-biting). 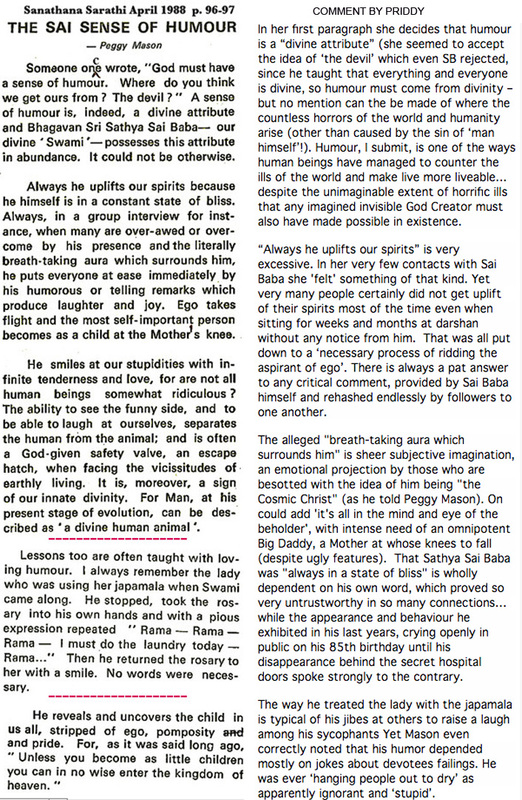 Nonetheless, the zealous and besotted devotee, Peggy Mason wrote an article entitled "The Sai sense of humour" (see scan of excerpts - click on the image to enlarge) and even published the contents in a small book (out-of-print). Peggy Mason was among the most gullible of devotees. With her husband Ron Laing, she ran a magazine 'Sathya Sai Baba' in UK. Before she found Sai Baba, she had been deeply interested in spirits, ghosts, mediums, spiritualism, contact with the dead… beliefs which she held onto right up to her last days. She wrote many articles and two books on this subject before she found Sai Baba. (My wife and I met them in the 1980s their home in Tunbridge Wells and at a Sai get-together in London. She had written a totally uncritical and self-censored book about SB as being 'The Embodiment of Love’, which my wife translated to Norwegian while we still were followers trying to 'see good and speak good etc.' ourselves. Peggy Mason always totally accepted as true every word Sai Baba uttered, and also repeated many unfounded rumours about him in her magazine without ever checking their reliability (such as the infamous ‘miracle in the sky’ story).